Quartz crystalline technologies have advanced dramatically especially since the work of IBM research scientist Marcel Vogel (1917-1991). The unique Vogel crystal geometric pattern given to each specific crystal significantly enhances their ability to increase the resonant frequency of the entire auric field. When laid with healing intent on the clients clothed body, dissonant vibrations are dispersed through the aura, meridians and chakras. It is important to understand that all natural life forms are subtly alive and that human beings have a subtle energy field component to their make up that is not visible to the naked eye. This unique therapy available from The Natural Medicine Practice is distinguished from other forms of crystal healing and termed Advanced Crystal Healing because of their superior geometric form, crystal material and unified energetic effect. The placing of these crystals on the client’s body and within non physical transpersonal fields of energy, above the head for example, helps assist the client in ways that are very individual to their own needs. They are aligned with transpersonal fields of the Self and these corresponding levels of higher consciousness; this connection and light infusion into the subtle bodies in itself is enough to remedy many health conditions over a course of monthly treatments. Advanced Crystal healing also works superbly well as a bridging therapy to Flower & Gem Essence Therapy, Homoeopathy and Radionics. The perception of Crystal Healing and what it involves is very varied indeed and depends also largely upon the individual level of development of the practitioner in healing arts in general. This unique therapy is vastly different in method and healing effect from the laying onto and around the body of raw crystals and polished stones. A straightforward way of interacting with a unadulterated crystal ‘oversoul’ or its ‘spirit’, can be facilitated by the placing of a suitably cleansed natural crystal one is drawn to in the palm of the left hand. By simply paying attention in the non-usual habitual way of physical sense reception, instead shifting this awareness to the various parts of the subtle fields of energy that surround the physical form. With patience, a ‘dialogue’ can emerge from the interaction of the crystals rate of vibration and the subtle energy currents coursing through the various subtle bodies. In a similar manner, a healthy synergistic balance may be restored by placing the correct crystal over an imbalanced area, which may then be restored to its ideal harmonic. 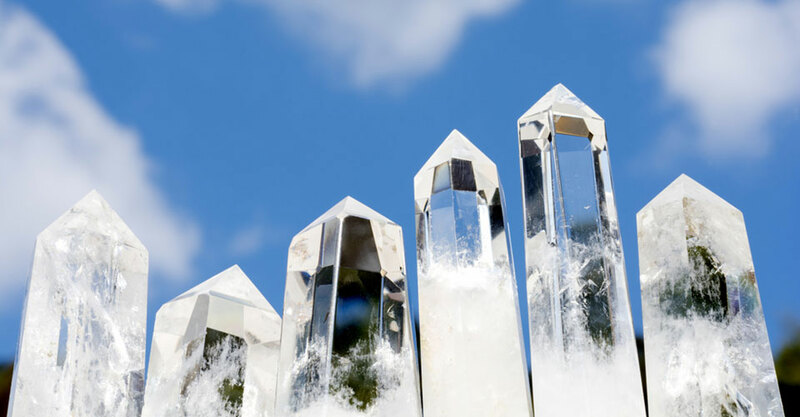 Advanced crystal healing makes use of a wide array of crystals with different qualities and colour – the special cut positively impacts lustre/light levels of radiation and in turn the way in which they can catalyse healing in a holistic manner. Living things possess an aura that surrounds the body as an energy field made up of layers. These layers of the aura are affected by the coherence of action of the advanced crystal healing set. These individual crystals become intensified in their unified action upon these various auric layers, rather like the concentric layers of an onion. Auric levels are as follows: Etheric body – is most close to the physical body and acts as its blueprint, often showing imbalance before physical disturbances. Emotional body – is perhaps the easiest to ‘clear’ and balance using highly coherent crystals. Classic examples of incoherent energies are, ignorance, greed and anger. Mental body – this layer holds ideas, belief and experiences. Astral body – acts as a boundary between usual conscious waking awareness and our spiritual self. Spiritual bodies – are represented via the most subtle outer levels, these nourish the individual with universal energy. These very fine subtle bodies are often the most difficult to address from the point of view of healing. Throughout human history, the healing properties of quartz crystals has led them to being valued as assisting a connection with upper or ‘spirit’ worlds. Modern science has been largely dismissive of such use and relegates these experiences to anecdotal or personal belief, yet the quality of crystals and minerals has led to their widespread use, such as in wristwatches, spark plugs, medical lasers and shuttle windows. Although it is understandable that scientifically measurable data is given centre-stage by the current intellectual mainstream, in day to day life it is personal experience which constitutes the main factor in human behaviour, choices and actions, and this is not always easy to quantify in purely scientific terms.